The Public Works Department consists of Utilities, Special Projects, Facilities Maintenance, Work Force, Grounds . Each division of Public Works has its own respective office or headquarters, the address listed above is my direct office. Utilities Department: a 24 hour on-call department with a state certified staff that provides safe potable water to the entire Quechan Indian Reservation and handles the sanitary sewer collection system. Meter installations, water main replacements, extensive water sampling, valve exercising and replacements and storage tank monitoring are some of the daily tasks the Operator must handle. Special Projects: This department works in collaboration with IHS designed plans for septic tank, drain field replacement, and other water services . The purpose of this department is to keep work on the reservation in house as much as possible instead of contracting out. Special projects also perform various other duties such as elderly assistance with resurfacing drive ways, demolition of abandoned homes and site cleanup and just about any construction type of work with experienced heavy equipment operators. 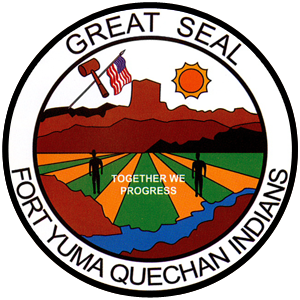 Facilities Maintenance: This Department handles the cleaning and janitorial services of the Quechan tribe administration building along with all the other tribal offices not located on the hill. They also now take care of the education complex and big house cleaning and janitorial services. 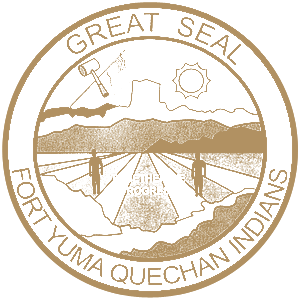 They have two staff members that handle light plumbing and electrical repair work along with various other elderly tribal member requests. Work Force: This department handles the traditional funeral arrangements located at the big house and also dig traditional burn holes for families that have suffered a loss. Work force also responds to Elder Member requests and have experienced heavy equipment operators. Grounds: This department provides beautification of the tribes walking park, sunrise park and big house along with the old head start area Through well experienced landscaping and extensive knowledge of sprinkler & irrigation systems. Click here to view the 2016 Consumer Confidence Report.